Andrew Johnson and Corinne Burrell assumed the throne as Homecoming King and Queen at Coronation Monday evening. The annual Coronation Ceremony kicked off Homecoming Week 2017 with live music from the Concordia Jazz Ensemble 1 and words of wisdom from last year’s royalty, Garrett Horesji and Grace Bateman. Johnson and Burrell were selected by their peers from a court consisting of Natalie Rivera, Bailey Hovland, Summer Hayes, Reyna Bergstrom, David Schneck, Erik Sneltjes, Ryan Walla, and Tyler Eliason. Burrell is a heritage and museum studies and communication studies double major from Moorhead, Minnesota. She plays violin in the Symphonia Orchestra, is a member of Students and Alumni Linked Together, serves as an Orientation and First-Year Transition Leader, and is this year’s Homecoming Chair. Her latest title, Homecoming Queen, is telling of her dedication and love for the school. Johnson is an accounting major from Foxhome, Minnesota. He is a member of Campus Events Commission, TEDxConcordiaCollege, Offutt Student Leader Organization, Students and Alumni Linked Together, Orientation, Percussion Ensemble, and Marimba Choir. 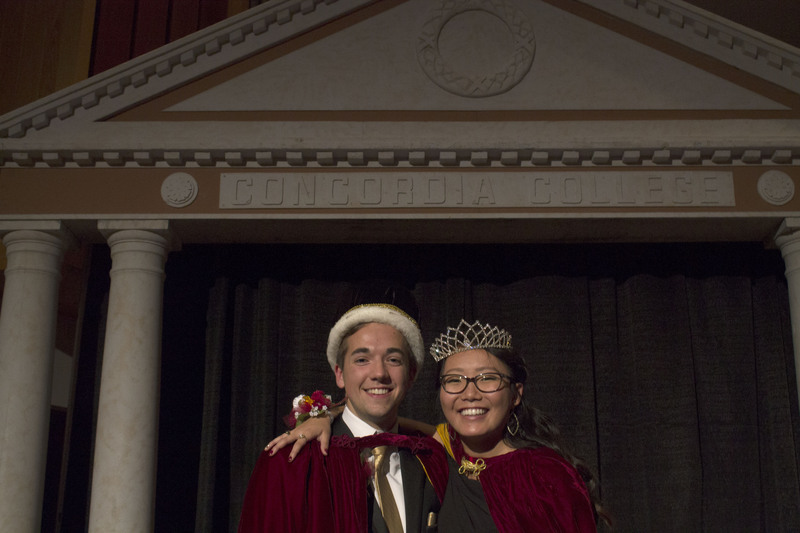 “I was shocked to be sitting on the stage at Coronation because there are so many well-rounded people in the senior class who embody various aspects of Concordia,” Johnson said. This is not the first time that Johnson and Burrell have teamed up to represent Concordia. Three years ago, they were appointed Freshman Class Representatives for the class of 2018. As part of the Corn Feed Crew, they spent this summer traveling and setting up corn feeds across Minnesota. Their travels took a dangerous turn when Burrell’s perfume sent Johnson to the hospital with a serious allergic reaction—a feeling, he said, that is not dissimilar to that of being named Homecoming King. Now that the royalty have received their crowns, Homecoming Week will continue with Frosh Frolics, the bonfire, and fireworks on Thursday; Homecoming Chapel and Bunco Night on Friday; the parade, tailgating, a football game against Gustavus, and Homecoming Concert on Saturday. Johnson said he most looks forward to seeing all of the returning alumni on campus. For Burrell, balancing the responsibilities of Homecoming Chair with the royal duties of Homecoming Queen will make for a busy week—but she still plans to have a little fun.